Earlier today, the Rosetta lander Philae successfully docked with the comet it’s going to study, 67P/Churyumov-Gerasimenko! 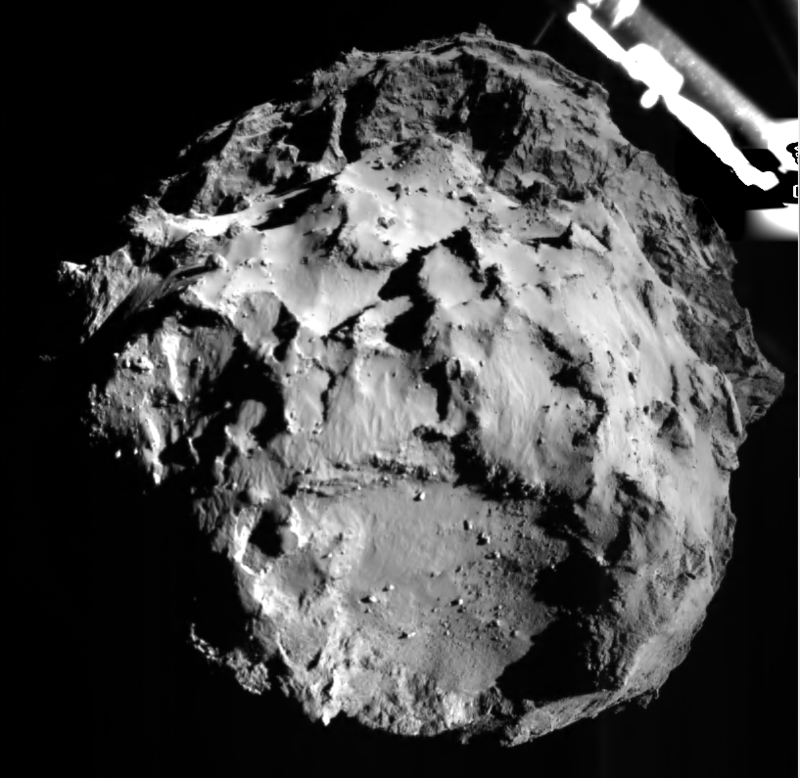 By now, the lander is busily doing science on the surface of a comet. Not bad for a robot built by a bunch of curious apes! Congratulations to everyone involved, and thanks for all the hard work! Over the next few days, Philae will take plenty of pictures of the landing site, analyse the comet’s surface materials, drill out a chunk of the comet for analysis in the onboard laboratory, and measure the electrical and mechanical properties of the surface. It will also cooperate with Rosetta to study the comet’s internal structure by sending low-frequency radio waves through it. Philae’s primary battery will only last for a few days; after that, a secondary, rechargeable battery may keep it going until March if the solar panels don’t get blocked. Rosetta’s job isn’t over yet. While Philae is studying the comet up-close, the spacecraft will keep orbiting the comet as it gets closer and closer to the Sun. In August, the comet will be at its closest to the Sun — ‘only’ 185 million kilometers, which is still slightly farther out than the Earth’s orbit. Rosetta will ride through the approach and stay with it on the outward journey, beaming back data the whole way. So there’s a lot to look forward to from Philae in the coming days and from Rosetta in the coming months! The picture, courtesy of the ESA, was taken by Philae during its descent; the lander was about 3km above the comet’s surface. Congratulations to the Rosetta team! Hello again, Rosetta! After a ten year journey, the spacecraft is only 16km from the comet it’s been sent to explore. 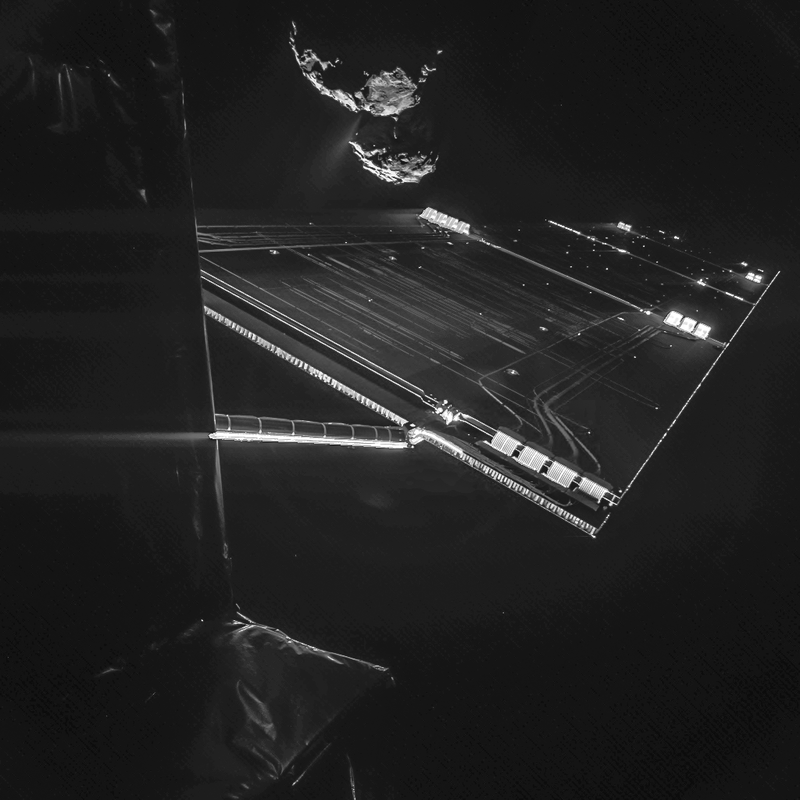 Earlier this week, it sent back this selfie showing one of its solar panels and the comet, 67P/Churyumov-Gerasimenko. 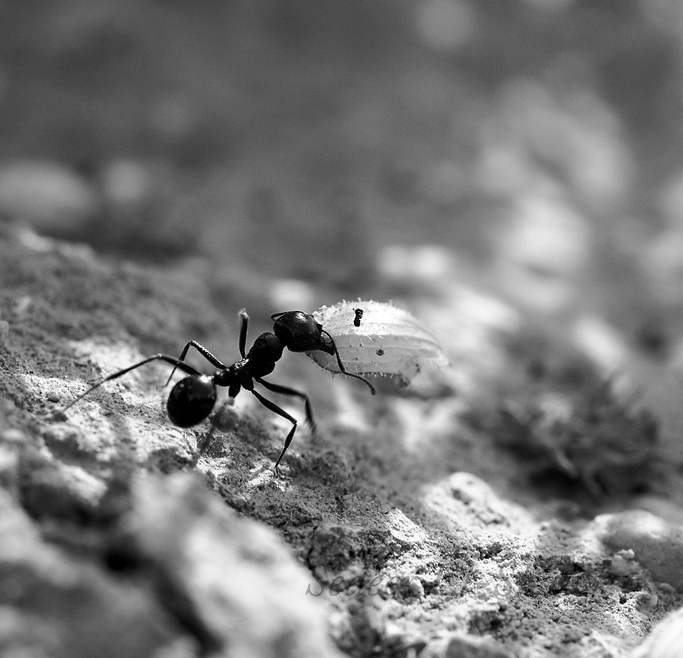 It’s an awe-inspiring image. A decade ago, we hurled this little ship out into cold, dark space. It looped around the solar system several times, sending back pictures of Mars and Earth as it looped past us to pick up speed. Barrelling out past the Mars’ orbit, it went to sleep to conserve power. Thanks to the hard work and careful planning of the ESA team, it managed to rendez-vous with the 4km wide comet after a journey of over 6 billion kilometers! That’s amazing! And now it’s sending back pictures as the two of them flirt and dance around each other while Rosetta looks for a place to put down its lander, Philae. Well done, humankind! And congratulations to the Rosetta team! There’ll be more news next month, when the docking itself should take place. Once on the comet, Philae will send back data for anywhere from a few days to a few months — we simply don’t know how long it will last on the comet’s surface. The picture is, of course, from the ESA. Well done!